Probiotics are live microorganisms capable of producing beneficial effects on its host when consumed in adequate amounts. To exert these effects, foods must contain probiotic microorganisms in populations above 106 CFU / g or mL throughout its shelf life. One of the strategies to ensure high population of probiotics in fermented milk is to add them during or after the fermentation process separately from the starter cultures. The objective of this study was to investigate the behavior of the probiotic microorganism Lactobacillus casei added to yoghurt in different stages of production. Yoghurts with L. casei were produced at different stages: before addition of starter (Streptococcus salivarius subsp. thermophilus and Lactobacillus delbrueckii subsp. bulgaricus), added together with this culture and at the end of fermentation. Yoghurt without probiotic added was produced as a control. The products were stored at 4 °C and analyzed after 1, 7, 14 and 21 days of storage. In these periods, the populations of probiotic and starter cultures were enumerated and the parameters pH and acidity were analyzed. The results were evaluated using analysis of variance and Tukey's test, both at 5% significance level. L. casei remained viable in populations of more than 108 CFU / g during 21 days of storage, which is suitable to define the formulations as probiotics. When the different stages of the addition of probiotics in yoghurts were evaluated there was no statistical difference between the formulations (p<0.05) for populations of L. casei except for the first day of storage. Key words: Yoghurt, Lactobacillus casei, fermentation, viability. Probióticos são microrganismos capazes de produzir efeitos benéficos sobre seu hospedeiro, quando consumidos vivos e em quantidades adequadas. Para que exerçam esses efeitos, os alimentos probióticos devem conter tais microrganismos em populações acima de 106 UFC/g ou mL, durante toda sua validade. Uma das estratégias para garantir a alta população dos probióticos em leites fermentados é adicioná-los durante ou após o processo de fermentação separadamente das culturas starter. Assim, o objetivo deste trabalho foi verificar o comportamento do microrganismo probiótico Lactobacillus casei adicionado em iogurte natural, em diferentes etapas do processo de produção. Foram produzidos iogurtes com adição de L. casei em diferentes etapas: antes da suplementação com o starter (Streptococcus salivarius subsp. thermophilus e Lactobacillus delbrueckii subsp. bulgaricus), juntamente com essa cultura e após o término da fermentação. Além disso, um iogurte controle (sem probiótico) foi produzido. Os produtos foram estocados a 4°C e analisados após 1, 7, 14 e 21 dias de armazenamento. Nesses períodos, foram enumeradas as populações das culturas probiótica e starter e avaliados os parâmetros físico-químicos (pH e acidez). Os resultados obtidos foram avaliados através de análise de variância e teste de Tukey, ambos ao nível de 5% de significância.L. casei mantevese viável e em populações superiores a 108 UFC/g durante os 21 dias de armazenamento, suficientes para que as formulações fossem definidas como probióticas. Quando as diferentes etapas de adição do probiótico aos iogurtes foram avaliadas, com exceção do 1º dia, não houve diferença estatística entre as formulações (p<0,05) para as populações de L. casei. Palavras chave: Iogurte, Lactobacillus casei, fermentação, viabilidade. Universidade Norte do Paraná, UNOPAR, Londrina, PR, Brasil. Probiotics are live microorganisms which when consumed in adequate amounts confer beneficial health effects on the host (1). However, to exercise these function probiotic foods must contain viable probiotic cultures in populations above 106 CFU / g during the shelf life of the product (2). According to Fuller (3), there are three possible mechanisms of action of probiotics. The first refers to the elimination of pathogenic microorganisms through the formation of compounds with antimicrobial activity. The second mechanism refers to changes in the microbial metabolism by increasing or decreasing the enzymatic functions. The third mechanism is based on stimulation of host immunity by increasing the levels of antibodies. In addition to controlling the intestinal tract, there are other benefits of probiotic cultures to the health of the host, such as stabilizing the intestinal microbiota after the use of antibiotics; promoting gastrointestinal resistance against colonization of pathogens; decreasing the population of pathogens through the production of acetic and lactic acids, bacteriocins and other antimicrobial compounds; increasing the lactose digestion in lactose-intolerant individuals; stimulating the immune system; relieving constipation and increasing absorption of minerals and vitamins (4). Other beneficial effects are also attributed to probiotic cultures: reduced risk of colon cancer, cardiovascular disease prevention, reduction of plasma cholesterol, antihypertensive effect, reducing the activity of ulcerative Helicobacter pylori, control of ulcerative colitis caused by rotavirus and Clostridium difficile, preventing urogenital infections, as well as inhibitory effects on the mutagenicity (5). A number of genera of bacteria are used as probiotics, including L. casei, which has proven benefits to human (2). For the production of fermented milk the conventional yoghurt bacteria L. delbrueckii subsp. bulgaricus and S. salivarius subsp. thermophilus also known as starter culture are added to promote the fermentation process (6, 7). The starter bacteria have a symbiotic relationship during its multiplication in the milk. The beginning of fermentation (acidity < 20 °D) favors the development of S. salivarius subsp. thermophilus, which is stimulated by certain amino acids (especially valine) produced by L. delbrueckii subsp. bulgaricus, causing an increase in acidity. In this phase, occurs the release of formic acid by S. salivarius subsp. thermophilus, which stimulates the growth of L. delbrueckii subsp. bulgaricus. Temperatures near 46 °C is unfavorable for the growth of S. salivarius subsp. thermophilus, favoring the rapid development of L. delbrueckii subsp. bulgaricus trains with production of acetaldehyde, which is the main responsible for the characteristic aroma of yoghurt (8, 9). Due to the metabolism of the strains of S. salivarius subsp. thermophilus and L. delbrueckii subsp. bulgaricus during yoghurt manufacture, the viability of probiotic strains added to these products may be impaired. The combination of probiotic strains with yoghurt cultures results in decreased viability of the probiotic during the shelf life of the product (10). The lactic acid production by L. delbrueckii subsp. bulgaricus during storage of yoghurt, which is so-called post-acidification, is one of the factors known to affect the viability of probiotic microorganisms in these products (7). Thus, due to the production of inhibitory substances by yoghurt cultures (starter) during the fermentation, it is important to search for each probiotics the best moment to its addition during processing of yoghurt. It is known that the addition of probiotic microorganism concomitantly with the starter culture or after fermentation may interfere its viability (10), which demonstrates the importance of correct timing of addition of each strain. The objective of this study was to investigate the behavior of the probiotic microorganism Lactobacillus casei added at different stages of the production of yoghurt, enabling the selection of the best stage of its addition in order to obtain a product with adequate population of this culture. For the production of yoghurt, UHT milk (Lider, Lobato, Brazil), skimmed milk powder (Molico, Nestle, Araçatuba, Brazil), starter culture Streptococcus salivarius subsp. thermophilus and Lactobacillus delbrueckii subsp. bulgaricus (YO-MIXTM 496 LYO 100 DCU, Danisco, Dangé, France) and probiotic Lactobacillus casei (431®, Christian Hansen, Valinhos, Brazil) were used. The inoculums of probiotic and starter cultures were prepared separately, one day before the production of yoghurt. To do so, the skimmed milk was reconstituted in water at 80 °C and cooled to 42°C. Subsequently, 2% of the lyophilized cultures were added to the reconstituted skimmed milk. The mixture was incubated at 42 °C until pH 4.8 was reached. All the inoculums were stored at 4 °C for 12-14 h until the production of yoghurt. Four yoghurt formulations were prepared: L1) without probiotic supplementation; L2) supplementation with the probiotic microorganism 1h before the addition of the starter culture; L3) supplementation with the probiotic microorganism added together with the starter culture; and L4) supplementation with the probiotic microorganism after the fermentation of milk by starter culture, as soon as pH 4.8 was reached. The UHT milk was heated to 40 °C and added of 4% skimmed milk powder to increase the dry matter and consequently improve the consistency of the yoghurt. The mixture was heat treated at 90 °C for 3.5 min to both destroy microorganisms which could compete with the cultures tested and promote the denaturation of whey proteins, which reduces the contraction of the coagulum and consequently reduces syneresis. After cooling to 42 °C, the cultures (probiotic and / or starter) were added to the different formulations, according to described above. The mixture was incubated at 42 °C until reaching pH 4.8. For this purpose, the pH was checked during the fermentation process every 30 min for two hours and every 15 min until pH 4.8. After this step, the product was manually homogenized, cooled and kept at 4 °C. All formulations were produced in triplicate. The yoghurts were stored for 21 days at 4 °C until the time of analysis. Microbiological (probiotics and starter counts) and physicochemical parameters (pH and acidity) of the samples were performed in triplicate after 1, 7, 14 and 21 days of storage. To carry out the microbiological analyzes, 10 g sample was homogenized into sterile bags with 90 mL of sterilized saline solution (0.95% w/v) to obtain the initial dilution (10-1). From this dilution, a number of decimal dilutions were prepared using the same diluent. For enumeration of Lactobacillus casei, the dilutions were plated in depth in MRS agar (Oxoid, Basingstoke, UK) supplemented with 1.5 g / L of bile salts. The plates were incubated for 72 h at 37 °C under aerobic conditions. For enumeration of Streptococcus salivarius subsp. thermophilus, dilutions were plated in depth in MRS agar (Oxoid) containing 10% lactose (Oxoid) and the plates were incubated for 48 h at 37 °C under aerobic conditions. For the enumeration of Lactobacillus delbrueckii subsp. bulgaricus, the decimal dilutions were seeded in depth in MRS agar (Oxoid) acidified to pH 5.4 with glacial acetic acid. In samples containing L. casei, the population of L. delbrueckii subsp. bulgaricus was obtained by subtracting the population of L. casei from the total number of Lactobacillus counted in acidified MRS agar. All microbiological analyzes were performed according to Lima et al. (11) and the results were expressed as colony forming units per gram of product (log CFU / g). The pH of the samples was determined by direct measurement using digital potentiometer TEC-2 (Tecnal, Piracicaba, Brazil). The titratable acidity was determined by titrating the sample with 0.1 N NaOH solution (Merck, Darmstadt, Germany) in the presence of phenolphthalein indicator (12). The results were analyzed by analysis of variance (ANOVA) and Tukey's test, both at 5% significance level, using the Statistica software (13). During the fermentation time, pH values of all products decreased significantly (p<0.05). Initially, the yoghurts L1 and L4 showed higher pH values (p<0.05) than the other formulations. The formulation L2, in which the probiotic microorganism was added before the starter culture, presented the lowest initial pH (p<0.05) and L3 showed an intermediate pH value (p<0.05). From 90 min of fermentation, there was no statistical difference (p>0.05) between the formulations. Figure 1 shows the pH values of yoghurt during the fermentation time (255 minutes). From the 1st and the 21th day of refrigerated storage, the pH decreased for all the formulations (p<0.05). This reduction was greater in L2 and L3, in which L. casei was added before and concomitantly with the addition of starter culture, respectively. The pH of yoghurt L1 was higher than L2 and L3 (p<0.05), since this sample was not added of L. casei. In contrast, L4 presented pH values similar to those observed in L1 (p>0.05), even containing L. casei in the formulation. FIGURE 1. pH values of yoghurt L1 (without addition of L. casei), L2 (L. casei before addition of the starter culture), L3 (L. casei added together with the starter culture) and L4 (addition of L. casei after fermentation) during the fermentation time. Figure 2 shows the pH and titratable acidity of yoghurt L1, L2, L3 and L4 stored at 4 °C for 21 days. There was no statistically significant difference between all the formulations after the 1st and 7st days of storage (p>0.05). However, at 14 and 21 days of storage, statistically significant difference was observed when formulations L1 and L4 where compared to L2 and L3 (p<0.05). 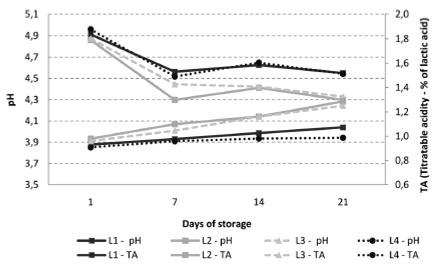 FIGURE 2. pH and titratable acidity values of yoghurt L1 (without addition of L. casei), L2 (L. casei before addition of the starter culture), L3 (L. casei added together with the starter culture) and L4 (addition of L. casei after fermentation) during 21 days of refrigerated storage (4 °C). Figure 3 presents the microbiological results obtained for starter culture. For populations of L. delbrueckii subsp. bulgaricus, the formulation L1 showed lower counts than the other formulations (p<0.05), ranging between 6.2 ± 0.5 and 5.6 ± 0.3 log CFU / g at the 1st and 21th day of storage, respectively. In contrast, the populations of L. delbrueckii subsp. bulgaricus found in formulations containing L. casei were significantly higher (p<0.05), reaching counts of 9.3 ± 0.2, 8.8 ± 0.1 and 8.1 ± 0.4 log CFU / g at 21th day for L2, L3 and L4, respectively (Figure 3a). Despite minor variations, there was no statistically significant difference in the populations of S. thermophillus for all the yoghurts studied (p>0.05) (Figure 3b). FIGURE 3. (a) Population of Lactobacillus delbrueckii subsp. bulgaricus and (b) Streptococcus salivarius subsp. thermophilus in yoghurt L1 (without addition of L. casei), L2 (L. casei before addition of the starter culture), L3 (L. casei added together with the starter culture) and L4 (addition of L. casei after fermentation) during 21 days of refrigerated storage (4°C). The probiotic populations observed in L2, L3 and L4 are presented in Figure 4. A higher population of L. casei was observed in formulation L2, when compared to the formulation L3 (p<0.05) at 1st and 7st days. When L2 and L3 where compared on days 14 and 21, no statistical difference was observed (p>0.05). The formulation L4 presented the lowest populations of L. casei, differing from the others during 7 days of refrigerated storage (p<0.05). At the end of refrigerated storage (day 21), no statistically significant difference was observed among L2, L3 and L4 (p>0.05). Regarding the time of addition of the probiotic microorganism it was found that, except for the first day, there was no statistical difference in the populations of L. casei for all formulations during the whole storage period (p>0.05). FIGURE 4. 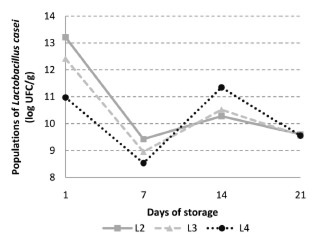 Population of Lactobacillus casei in yoghurt L2 (L. casei before addition of the starter culture), L3 (L. casei added together with the starter culture) and L4 (addition of L. casei after fermentation) during 21 days of refrigerated storage (4 °C). 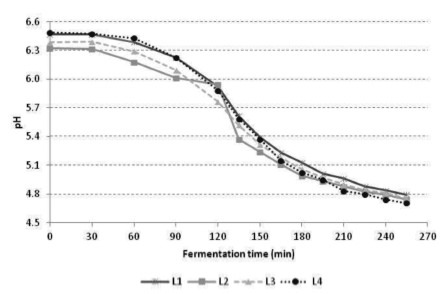 The addition of L. casei at the end of the fermentation process in L4 resulted in pH values similar to L1 (p>0.05) since the yoghurt was cooled promptly after addition of the culture. Thus, the low temperature contributed for decreasing the metabolism of L. casei in L4, which resulted in pH values higher than those observed for other probiotic formulations. The reduction in pH and increase in titratable acidity values observed during the whole storage period is a natural process caused by the continuous production of lactic acid and other organic acids by starter culture added to yoghurt. Also, the presence of probiotic microorganism contributed to low pH values in L2 and L3, since L. casei are capable to produce lactic acid from hexoses (14, 15). Thamer and Penna (16) produced 12 functional dairy beverages formulations containing Lactobacillus acidophilus and Bifidobacterium and a prebiotic ingredient. After completion of fermentation and cooling, the pH ranged between 4.72 and 4.83. The authors highlighted that by starting the cooling at pH 4.8, it prevented excessive lowering of pH, which when less than 4.0 may decrease the protein hydration and the clotting property, resulting in separation of the whey. Kempka et al. (17) developed a fermented milk drink peach flavor with the addition of a culture consisting of Streptococcus thermophilus, Lactobacillus bulgaricus, Lactobacillus acidophilus and Bifidobacterium. The authors found that the pH values decreased significantly during storage at 4 °C, ranging from 4.93 (day 1) to 4.32 (day 19), similar to that observed in the present study for the formulations with L. casei, particularly in L2 and L3. In contrast, the results observed in formulation L4, revealed a manufacture process that may minimize the excessive post-acidification during the shelf life of the product. Although the metabolic activity of lactic acid bacteria be reduced under refrigeration, the final product may suffer a phenomenon called post-acidification, that is the decrease of pH during storage due to persistent metabolic activity of the starter culture added to the product (mainly L. delbrueckii subsp. bulgaricus) (18). The presence of L. casei did not affect L. delbrueckii subsp. bulgaricus populations, since populations above 8 log CFU / g were detected in yoghurt at 21th day of storage. Between the 1st and the 7th day of storage, there was a decrease in the populations of L. casei for all formulations probably due to stress caused by the process and / or low temperature. Between the 7th and 14th day there was an increase in the populations of L. casei probably due to adaptation of the microorganism to the matrix that constitutes the product. At the last week's storage of yoghurt, there was a reduction of these populations probably caused by adverse conditions, such as lack of nutrients and low pH. Although some variations and reductions were observed during the storage period, L. casei populations remained always above the minimum recommended for a probiotic food (106 CFU / g). Therefore it was possible to consider the formulations L2, L3 and L4 as probiotic yoghurts established by the Brazilian regulation (19). Similarly, Kristo et al. (20) produced probiotic fermented milk containing Lactobacillus paracasei B117 in co-cultured with Streptococcus thermophilus and Lactobacillus bulgaricus Y4.10 and Y6.15. 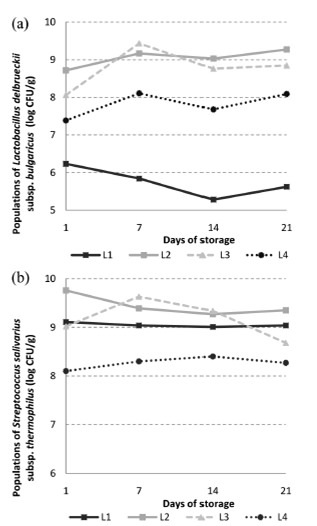 The authors found that populations of L. paracasei remained with counts of 106 CFU/mL during 21 days of storage at 4 °C. Regarding the time of addition of the probiotic microorganism to the yoghurt, different results from those observed in this study were verified by Lankaputhra and Shah (6), which produced yoghurt by fermenting milk initially only with probiotic microorganisms L. acidophilus and B. longum for two hours. After this period, when such microorganisms were in the final adjustment phase or in early log phase, the cultures of yoghurt were added. After six weeks of storage, the authors observed that the probiotics counts were approximately one log cycle greater than when these microorganisms were added before the yoghurt cultures as compared to the yoghurt with cultures added concurrently. The probiotic microorganism Lactobacillus casei remained viable, in populations above 8 log CFU / g during the refrigerated storage of yoghurt. Regarding the best step of adding the probiotic microorganism during processing of yoghurt, there was no statistically significant difference between the populations for the formulations with the exception for the first day. Thus, all forms of probiotics addition studied were efficacious and revealed the possibility of obtaining probiotic yoghurt concerning the shelf life studied. Also, the results revealed that the excessive post-acidification can be minimized during the shelf life of the product, with probiotic supplementation after fermentation of milk by the starter culture. Sanders ME. Probiotics: considerations for human health. Nutr Rev. 2003; 61: 91-9. Shah NP. Functional cultures and health benefits. Int Dairy J. 2007; 17: 1262-77. Fuller R. Probiotics in man and animals. J Appl Bacteriol. 1989; 66: 365-78. Saad SMI. Probióticos e prebióticos: o estado da arte. Rev Bras Ciênc Farm. 2006; 42: 1-16. Tuohy KM, Probert HM, Smejkal CW, Gibson GR. Using probiotics and prebiotics to improve gut health. Drug Discov Today. 2003; 8: 692-700. Lankaputhra WEV, Shah NP. Improving viability of Lactobacillus acidophilus and bifidobacteria in yoghurt using two step fermentation and neutralized mix. Food Aust. 1997; 49: 363-66. Dave RI, Shah NP. Ingredient supplementation effects on viability of probiotic bacteria in yoghurt. J Dairy Sci. 1998; 81: 2804-16. Walstra P, Geurts TJ, Noomen A, Jellema A, Van Boekel MAJS. Dairy technology: principles of milk properties and processes. New York: Marcel Dekker; 1999. Vedamuthu ER. Starter cultures for yoghurt and fermented milk. In: Chandan RC, editor. Manufacturing yoghurt and fermented milks. Oxford: Blackwell Publishing; 2006. p.89-115. Saarela M, Mogensen G, Fondén R, Mättö J, Mattila-Sandholm T. Probiotic bacteria: safety, functional and technological properties. J Biotechnol. 2000; 84: 197-215. Lima KGC, Kruger MF, Behrens J, Destro MT, Landgraf M, Franco, BDGM. Evaluation of culture media for enumeration of Lactobacillus acidophilus, Lactobacillus casei and Bifidobacterium animalis in the presence of Lactobacillus delbrueckii subsp. bulgaricus and Streptococcus thermophilus. Food Sci Technol. 2009; 42: 491-95. Association of Official Agricultural Chemists. Official Methods of Analysis. 15 ed. Washington, 1995. 109. Statsoft, Inc. Statistica for Windows [Computer program manual]. Tulsa, OK: StatSoft, Inc. 2000. Axelsson L. Lactic acid bacteria: classification and physiology. In: Salminen S, Wright A, Ouwehand A, editors. Lactic acid bacteria: microbiological and functional aspects. New York: Marcel Dekker; 2004. p.1-66. Vásquez A, Molin G, Pettersson B, Antonsson M, Ahrne S. DNA-based classification and sequence heterogeneities in the 16S rRNA genes of Lactobacillus casei / paracasei and related species. Syst Appl Microbiol. 2005; 28 (5): 430-41. Thamer KG, Penna ALB. Caracterização de bebidas lácteas funcionais fermentadas por probióticos e acrescidas de prebióticos. Ciênc Tecnol Aliment. 2006; 26: 589-95. Kempka AP, Krüger RL, Valduga E, Di Luccio M, Treichel H, Cansian R, et al. Formulação de bebida láctea fermentada sabor pêssego utilizando substratos alternativos substratos alternativos e cultura probiótica. Ciênc Tecnol Aliment. 2008; 28: 171-75. Beal C, Skokanova J, Latrille E, Martin N, Corrieu G. Combined effects of culture conditions and storage time on acidification and viscosity of stirred yoghurt. J Dairy Sci. 1999; 82(4): 673-81. Kristo E, Biliaderis CG, Tzanetakis N. Modelling of rheological, microbiological and acidification properties of a fermented milk product containing a probiotic strain of Lactobacillus paracasei. Int Dairy J. 2003; 13: 517-28.